Looking for private in-home or in-studio Classical Voice lessons? Our Royal Oak teachers are ready to get you started. Find your teacher today! Check out some of our most popular teachers near Royal Oak, MI including Troy, Sterling Heights, Detroit, Bloomfield Hills and Birmingham. From the art song to the aria, whether secular or sacred, we will concentrate on the classical genre to build your skill. I focus on a holistic approach to produce a healthy sound that will last a lifetime. Hi there! My name is Ylona (I used to go by Marie, for those who see me referred to as Marie in places). I have my bachelor's (2002) and master's (2004) both in music (concentration in vocal performance). Additionally, I began taking piano lessons when I was 4. On the health side, I just have finals left to finish to complete my doctor of naturopathy. So, if you have questions about healing, naturopathy, wellness, essential oils, homeopathic remedies, vaccines, body work therapies, energy work therapies, iridology, and many many more things relating to our health, I have answers because I offer natural solutions for natural health. nd, and spirit, and music requires all of these to really be effective! Just a few notes. I have cats and a dog, so if you have allergies you may want to reconsider (or contact me to learn how naturopathy can help your body correct those naturally). My music studio is upstairs. My naturopathic office is down a few stairs (though we may be able to work something out to bring you around the back on my deck). For both, if there are mobility concerns, let me know. We might be able to work something out. For voice lessons, I generally find students younger than 12 do not like my style of teaching. This is because I focus on technique and healthy sound and am not just there to listen to your child sing their favorite pop song and offer no value of how to improve. Because of this, I usually won't accept voice students under 12. If you believe your younger child is unusually focused on learning to sing, we can talk though! I look forward to working with you to help you reach your music or health goals! Or both!! Marie is very patient and easy to work with. She makes learning the piano fun! Marie is extremely patient, and very encouraging. When the kids talk, she hears them out, and is attentive. I would definitely recommend her as a teacher! I teach classical voice, and work with students developing a proper healthy technique from a classical point of view. Liz T is an accomplished performer, writer and educator who has captivated audiences and students across the globe! Trained in Classical, Jazz and Musical Theatre her warm voice, playful attitude, and vibrant inner beauty come alive on the stage and in the classroom. With International and Cabaret influences, she performs and writes deeply from the heart, and is never afraid to pour out heart felt emotions on stage. World class performances at venues include: Carnegie Hall, The Vatican, Notre Dame Cathedral, Palau de les artes de Regina Sofia, and Symphony Space. Liz T has also performed with the Amore Opera, NY Lyric Opera and Regina Opera companies of New York City. Disney Live! (Feld Entertainment), Nickelodeon at Sea (Norwegian Cruise lines), Macy's Thanksgiving Day Parade (NBC), RWS and Associates, Carnival Cruise lines and legendary summer stock theaters including Ogunquit Playhouse, ME and the Granbury Opera house, TX . Past NYC Music Venues include (Select): The Metropolitan Room, The Cutting Room, Ashford & Simpson's Sugar Bar, Toshi's Living Room, The Shrine, Silvana, The Bitter End, The Path Cafe. Past TV/Film Selections Include: Orange is the New Black, Elementary, Law and Order SVU, Mozart in the Jungle, Grown ups 2, Labor Day, The Makeover, Nurse Jackie, The Knick, Blue Bloods, The Following, The Woody Allen Summer Project, Madame Secretary, Mysteries of Laura, Royal Pains, Teenage Mutant Ninja Turtles 2, The Heat, The Carrie Diaries, Vinyl, Public Morals,The Tap, The Only Boy in New York, Irreplaceable you,The Leftovers, Marvelous Mrs. Maisel and Bull. Liz T has a passion for singing jingles, and recording voice overs all around the world for clients in India, New Zealand, France, Israel, Philippines, and Russia to name a few, be on the lookout as you never know where you may hear her Voice! Liz T has had the pleasure of Musical Directing with various inner city schools with young, at risk students including Inside Broadway, Brooklyn Arts Council, Mainstages, The Queens Theater, Long Lake Camp for the Arts, Berklee City Music Program, Boston Bridge Charter School, and St. Joseph's Regional Catholic School. Past shows she has musical directed have included Annie, Legally Blonde, The Wizard of Oz, Seussical, Oliver, Shrek, and Chicago. Liz also serves on the Berklee Alumni Audition Committee, and was recently named Berklee Alumni Ambassador of the Year in 2017. Currently she is working on her original musical Ciao Bambino, which debuted it's first staged reading at the Midtown International Theater Festival in the Fall of 2016, and Off-Off Broadway at the 13th Street Repertory Theater! At MITF Ciao Bambino was recognized with an award for Best Staged Reading. "Give me the stage" an original song from the musical also won first place in competitions at the Bunol Symphony Orchestra in Spain and Hampton Beach talent show in New Hampshire. Coaches: Dr. Madelyn Gearheart, Dr. Lisa Sylvester, Catherine Ciesinski, Joyce Fieldsend, David Walsh, Laura Athey-Janka, Darrell Babidge, Gerardo Felisatti and Gordon Ostrowski. Miss. Turner is a member of the following professional organizations: SAG-AFTRA, The Dramatists Guild, BMI, Society of Composers and Lyricists, The Drama League, The Manhattan Association of Cabaret Performers, AFM Local 802, Actor's Equity Membership Candidate, Theater Resources Unlimited, The Off-Broadway Alliance, Women in Music, National Italian American Foundation, National Organization of Italian American Women, International Women's Jazz Association and The League of Independent Theatre. I like to work with students at all levels, whether you sing for your own enjoyment or are serious about pursuing a career in performing, I want to help you be the best performer! Please send me a message before you sign up for lessons so we can coordinate time difference/scheduling, Thank you! your the best. I'm 10 and must sing in 3 days in a talent show and sure found your help useful. Ms. S. has a Master's degree in Vocal Performance from Eastern Michigan University and has performed with regional opera companies. Singing is a complex coordination of breathing, phonation, resonation and articulation, overlaid with musical and performance layers. Classical singing also requires an acting component, as intent alters and influences the sound. Barbara S. is happy to nest in Ann Arbor, Michigan after many years in New York City and on the road with national tours of "The Phantom of the Opera" (Carlotta and Madame Giry), “Camelot” (Broadway and National Tour) and an international tour of “Evita”. She has appeared locally and regionally with many Equity theaters and opera companies. Ms. S. has a Master's degree in Vocal Performance from Eastern Michigan University and is certified Level III in the Somatic Voicework™ The LoVetri Method. She has also trained in Estill Voice through the University of Michigan, with additional training in the Feldenkrais Method of movement. She is a member of the National Association of Teachers of Singing (NATS). She will tailor your vocal development to your individual performance goals. This was my daughter's first class, and she loved it. My daughter was trained in opera, and was looking for a teacher who will help her do the transition to musical theater. Well, she has found such teacher. Ms. Barbara not only has the educational background to help her, but also has a wealth of knowledge thru her personal experience as a musical theatre performer. My lessons have been so much fun ! I'm understanding more & feel like I'm growing a little more each week. Barbara is very talented...I'm loving & learning ! Over 17+ years of experience in vocal performance, and can teach opera, classical technique, mixed languages, as well as pop singing and the more contemporary "radio-play" music that most people are wanting to sing. I own a local music/art/production institution which hosts lessons for many instruments and artistic pursuits. Personally, I've been teaching for over 17 years, and I teach beginner to advanced students in instruments like guitar, bass, piano/keys, voice, and drums, and depending on your needs, our studio offers a variety of professional teachers that teach all woodwind, brass, and stringed instruments. I also am an online teacher for a the world's biggest web platform for guitar instruction, and teach lessons alongside those in Berklee alumni, Musician's Institute, as well with many very famous artists that are now in the music business. the intermediate levels the most. I enjoy watching people discover things for the first time, and in my teaching I really do my best to craft my lessons to the needs of the students. My primary aim in teaching is that I would cultivate in my students a love for music and learning. With these two things in place, a student can go on to be and learn anything. Join me and my studio. We'll have a great time, and we'll get you to your goals while we're enjoying the journey of music together!! Dave was great. Easy to understand and showed me where I need to improve. Amazing with my son! Much more than I expected! My son can’t wsit for his next class!! Dave is a natural. Dry easy to talk to and my son learned a lot in jus the first session. I have been teaching all levels of voice for over 15 years with emphases on Breathing, Posture, Vocal Production, Sight Singing, Diction using the International Phonetic Alphabet (IPA), and Performance Techniques. I also teach fundamental piano with emphases on the Musical Alphabet, Hand Position and Finger Numbers, Rhythm in Music, Beginning Music Theory, Scales, and Performance Techniques. My purpose for teaching voice and piano is to fulfill the need for quality performing arts instruction. My goal is to train and assist artists in the development of their instruments through individual instruction, practice, and performance. Rochester Symphony, and the Cincinnati Music Festival. I also represented the United States in the International Competitions in Montreal, and I was a finalist in the coveted Metropolitan Opera auditions in New York. I was contracted with the Deutsche Oper am Rhein (the German Opera on the Rhine Company), where I was the leading young dramatic soprano, and I toured with the company seven years. I received my Master of Music in Vocal Performance from Wayne State University College of Fine, Performing and Communication Arts, where I performed various opera roles and studied Vocal Pedagogy. I was guest soprano with the Rackham Symphony Orchestra and Friends of the Opera in Dearborn, the Menc conference, and the Kerrytown Concert House in Ann Arbor. I was also artistic director of the Arts Center Music School in Detroit where I taught all levels of voice and fundamental piano. One of my voice students is enrolled in a major music school in New York, another is a songwriter and recording artist in Detroit, and another recently auditioned and was accepted into the Mosaic Youth Theater in Detroit. In addition to guest solo appearances, I currently have two works in progress, including, a monolog with my original composition, and a demo for a new CD featuring my original compositions. She has a lot of experience and nice person . I am enjoying to taking a lesson from her. Excellent piano teacher! Very patient with my 8 year old son. She taught lessons for his older siblings and they as well appreciated the instruction that they received! Wonderful instructor. Wonderful voice to listen to. Very knowledgeable. Just amazing! Couldn't ask for someone better to learn from. I am a Vocal Music Education major in his Senior year at Wayne State University. I am a tenor and hold two positions singing gospel professionally, one as Tenor Section Leader of Fort Street Presbytarian, and another as a Tenor at the Grosse Pointe Memorial Church. I am also the Vice President and Section Leader for the WSU Concert Chorale, an audition level choir. I have 15 years experience singing and have studied under several very experienced teachers, the current of which is Dr. Troiano. My studio revolves around a solid technique that comes with ear training, breathing, phonation, and clarity of sound. The style I teach hinges on this foundation, and thus is greatly applicable to any style of singing. I am a current WSU student of Vocal Music Education with my principle instrument as voice (Tenor). I'm 25 years old, and a well rounded musician with a great sense of humor and a laid back attitude. This isn't to say that my lessons are all fun and games; there is a serious element to every session, but students have always give positive feedback in that they feel very comfortable with me. I have been singing for 15 years and do so professionally in two churches, one of which I am the section leader of (Fort Street Presbyterian in Detroit). I am also the section leader of the WSU Concert Chorale, the audition level choir. For both voice and guitar, I have studied under numerous great men and women who have guided my practices to the point where I have began to pass my knowledge to others! nes follow and logical and practical guideline that will allow musicianship in it's greatest form to bloom forth from the student. Heavy emphasis on solid technique, artistry, theory, and ear training makes for a well rounded and informed player/singer! I can teach from my home, your home, online, or even from the practice rooms at Wayne State if Detroit is a good middle ground or closer for you! It was my first time ever doing a private vocal lesson. I had an audition to prepare for, and went to the only person I would trust. He is so knowledgeable and made things super easy to understand. I felt not only relaxed, but he built up my confidence while teaching me the proper way to shape my vowels. He gave me some techniques for relaxing and breathing, too, which is super helpful for my anxiety. Wouldn't go to anyone else! Dane is an excellent teacher to work with. You can get a lot accomplished with him any time you work with him. He'll make you feel super comfortable in your own abilities no matter what level you are, while also working with you towards realistic goals. He explains things very well and with patience. He'll treat you way more on a personal one on one level than anybody I've tried to work with thus far. Extremely understanding, and great teacher. 11/10. Very helpful. Works at your pace. Makes it so you can easily understand new things. It's nice to not feel pressured to get something down quickly. I feel like I'm learn a lot comfortably. Classic singing technique and performance skills are at the heart of what I teach. Lessons start with exercises that help you learn how to take deep natural breaths and use your diaphragm to support your voice. Vocal exercises will help you develop the quality of your voice and increase your range making it easier to hit those high notes. You will also learn how to use phrasing as you sing to put feeling into the words and connect with the audience. As your voice develops you will build a repertoire of music in any style that you like to sing. If you like to sing and want to learn how to be a better singer, you don't have to have any previous experience or training. I specialize in teaching beginning singers of any age how to sing using the classic technique that is the foundation for singing any genre or style of music from Bach to Broadway. You will learn how to make a beautiful sound when you sing and work on presentation, acting, diction, style, and artistry choosing music that you like and building a repertoire of music that you will enjoy singing. Some children also have beautiful natural voices, but they are not ready for the kind of voice training that is appropriate for an adult. A child's voice is small in every sense of the word. They cannot produce the volume or range that an adult can without straining their voice. They can learn the fundamentals of music, how to read music, how to count, rhythm and musicality. The music chosen for them needs to be easy to sing and age-appropriate Songs that a child likes that are too high can easily be re-arranged in a different key so they can sing music that they like without straining their voice. 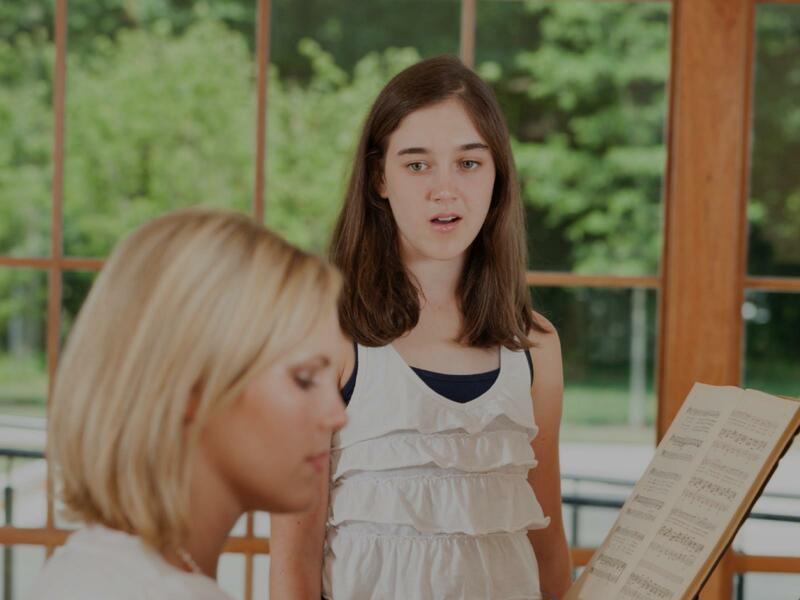 If you are considering voice lessons for you or your child, it is a good way to develop musicianship and build a repertoire of music that you will enjoy singing. The training will be enjoyable and very effective. You will begin to see an improvement in technique after the first lesson. I was trained in voice performance at the Cleveland Institute of Music with Marie-Simmelink Kraft, a Mezzo-Soprano who performed with the Cleveland Orchestra and other Synphony Orhestras throughout the world. I hold a degree from Case Western Reserve University where I studied art and music theory. I have more than twenty years of professional experience that inclues singing with a Chorale that performed with the Cleveland Symphony and performances as a soloist for choirs in Ohio and Michigan. I founded and directed the Academie des Beaux-Arts, a performing arts school in Birmingham, and the Actors Alliance Theatre, a professional theater company that gave many young people an opportunity to gain experience working with professional actors. I have a combination of skills in voice and theater performance that sets me apart as a teacher who can help you develop a better singing voice and learn how to perform with artistry. a great start with an awesome teacher who is truly passionate with music and teaching. She works on getting you to be good. Very good. Extremely perceptive, sophisticated and talented teacher. Great with people and very respectful. I have been helping people realize their potential as a singer for over 5 years now. Along with being a vocal coach and teacher, I have over 10 years of performance experience in a variety of styles. In terms of jazz, I have studied with jazz greats such as Sunny Wilkinson, members of The New York Voices, Rosana Eckert, and more! I have also worked with many great pop and musical theater instructors such as Matt Edwards and Edrie Means. In 2018 I received my session 1 certification in contemporary commercial music from Shenandoah University. Hello! I am a performer, voice teacher, and vocal coach who strives to help others experience their potential as a musician. I have studied with some jazz greats such as Sunny Wilkinson, The New York Voices, Rosana Eckert, Greg Jasperse, and more! I have also worked with many great pop and musical theater instructors such as Matt Edwards and Edrie Means. In 2018 I received my level 1 certification in contemporary commercial music from Shenandoah University. I have also studied vocal health with the world-renowned speech-pathologist and educator, Marci Rosenberg. ginning to advanced voice students. While helping singers realize their potential, a big focus of my lessons includes vocal health. I want to give my students the knowledge they need in order to maintain their vocal health - whether at home or on the road. This will ultimately help them as a vocalist, musician, and a performer. I look forward to talking with you more, and helping you reach your goals as a singer and musician! Hello and congratulations on your decision to find the RIGHT voice teacher for your unique needs. I have been teaching voice for 27 years, both locally and internationally, and have studied voice for 40 years. I teach all styles, ranging from classical to musical theater, R&B to pop and jazz. I can help you cross-train and learn to sing multiple styles authentically. I also still study voice and perform frequently (again, classical to classic rock), so I understand the needs of all types of singers. I challenge all of my students at their own particular levels by prescribing vocal exercises for quick and longer term solutions, then applying it to their chosen songs. Our lessons are always fun! I treat all of my students like they are going to be on the big stage, regardless of experience, and also provide regular performance opportunities for them. g multiple styles healthily and authentically! Overcome tension, vocal fatigue and fear so that you can finally reach your maximum potential. I have had many students win competitions at the local, regional and international levels; and pursue careers in singing, teaching and/or conducting. I also love helping beginning singers find and free the voice that lies within them. Every one of my students is important to me, and I treat them all like they will be on the big stage, whether it is a goal or a dream! Complimentary 10 minute phone consultation available. Let me answer your questions or discuss your goals! Over the years I've taken voice lessons to improve core skills. Not all voice teachers are the same! I started with Ms. Rapanan’s group class just to check out her skills and style of teaching. I discovered a truly great teacher who integrates her long-earned breadth and depth (classical to pop) styles of singing into her teaching methods. This is rare! I truly enjoyed her challenging and inspiring me to push my limits. And, she's fun to work with. She has a high-energy positive teaching style. Maybe what I like most is that she personalized my lessons; taking into account my particular voice, style, and, limitations/strengths. I have not found these teaching attributes elsewhere; knowledgeable with great command. Since she is a serious -but loads of fun- teacher, I totally endorse her for serious and committed students. Victoria Rapanan is a solid vocal technician who transforms voices. She can really diagnose vocal issues and provide specific and clear solutions in a fun and creative manner. Her students are excellent singers. Victoria is also a magnificent performer. I give her my highest rating in all categories. Can't find a teacher in Royal Oak, MI? Students are raving about their Classical Voice instructors on TakeLessons. Check out some of these recent reviews. g for the teacher who will teach you basics or master your voice or even, give you a professional advice on your singing, she is right here. You will feel that your singing is improving from the very first lesson. I did and I highly recommend you Viviana, I think everyone can become the top-rated singer with her help. Plus, she is just incredibly fun to be in the classroom with. Thank you for everything you are doing for us!" Detroit, MI teacher: Viviana G.
"Extremely perceptive, sophisticated and talented teacher. Great with people and very respectful." Detroit, MI teacher: Helen B.
er gotten if it wasn't for her."